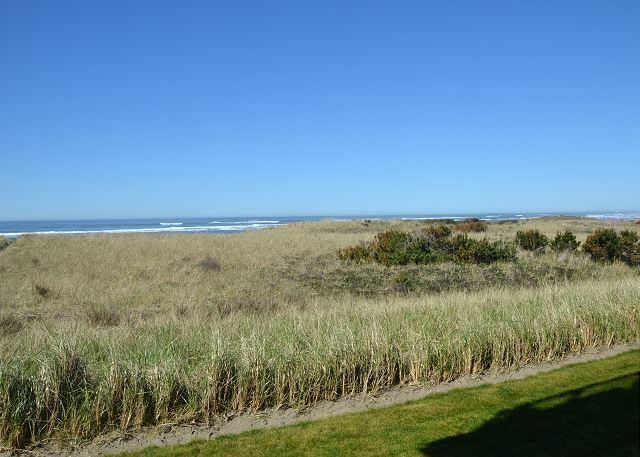 Enjoy any season in this great ocean view condo with easy beach access. 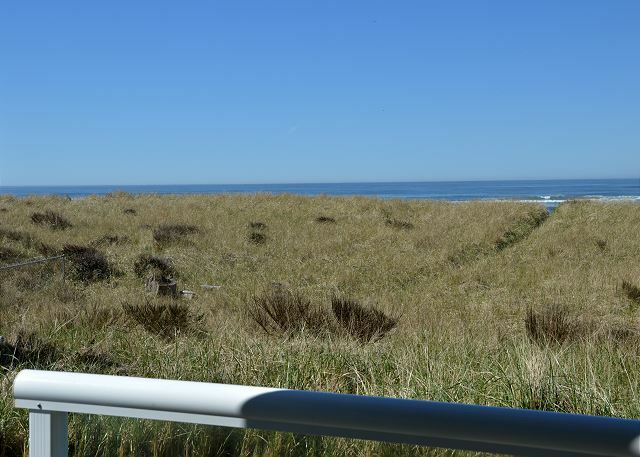 This is spacious two-bedroom, ground floor, pet-friendly unit offering quick access tot he beach and great views of the Pacific Ocean from the living room, kitchen, and Master Bedroom. The owners take pride in their vacation home which can be seen in the beach art, decor, and furnishings throughout. Facing west, this condo offers great sunsets and the afternoon sun makes the condo glow. A maritime print by David Hollenbeck is proudly featured in the condo. The owners hope you find their beach home and Westport an inviting place to visit any time of the year. We and our Lab enjoyed yet another long weekend in #112. We have been coming to VBTS for years and 112 has become our favorite. The convenience of the ground floor condo, the view and the condo itself are fabulous. Thanks to the owners for sharing their home with us. We will be back as soon as we can! Our second stay in 112. We have stayed multiple times at VBTS but 112 has become our favorite. The convenience of a first floor dog friendly unit and the view cannot be beat! The condo is well furnished with fully equipped kitchen. The only thing that would make 112 perfect would be a king sized bed in the Master. The master bed....was super comfy! Only downfall was that we could hear the upstairs condo toilet flush in the master bedroom. Had a wonderful family vacay again here! These condos are a perfect location with an awesome bike trail to Westport. Thanks for staying and happy to hear you took advantage of the wonderful walking/bike trail to town. It's a unique feature here in Westport and we love telling folks about it when they are looking for something to do in town. It was great. I had rented a 3rd floor condo, not realizing there was no elevator in that building. I called the day before arriving when I realized it and they were able to place me in a ground floor unit. They were great. The condo was super clean and the beds comfortable. Very well furnished, attractive, comfortable and clean. Our condo was on the bottom floor and we walked right out onto the beach with our dog! Wonderful amenities, great memories and a beautiful stay! Thank you! We live this unit - it’s Comfortable for people and pets, and no stairs for my elderly father in law. Took at quick couple days thinking the weather would be stormy and wet. Had AMAZINGLY good weather, good beach and path walks. Stayed in Building 1 first floor - good for getting out with the dog. Little issue with the TV but otherwise - just perfect. The condo we rented was perfect. Everything was clean and ready for us when we arrived. The kitchen is very well stocked with gadgets we hadn’t even thought about using until we saw them. They also included the miscellaneous spices, oil, plastic wrap, aluminum foil, etc. that always comes in handy when you are away from home. They have a large TV that we enjoyed in the evening in the comfortably arranged living area. The beds were comfortable and the bathrooms were clean. It has a view of the ocean with a path nearby. We recommend this condo to others looking for a nice clean and quiet getaway. Westport is a great low key beach, fishing town that welcomes dogs! We loved our condo! It was the perfect loctaion for us. This has been our 4th-5th time staying with Vacations by the Sea over the years. All have been in different condos and this dog friendly 2 bedroom 2 bath did not disappoint. The location is perfect for dogs and kids to run down to the ocean knowing they are not far away (plus easier now that kids are older and can do those activities by themselves). The rock painting craze that is taking over even made it to the ocean where our son found a painted sand dollar. We were able to enjoy the pool (as we typically come during off season to watch the storms ), which of course was our kid's favorite. The staff was very friendly, helpful and worked with us to find a condo that would work. Somehow finding this condo available during our last minute decision to have one final extended weekend away before school started. When we came home and unpacked and discovered a week later (as it takes that long to unpack sometimes) we discovered we left behind our fire stick in the bedroom. The staff was able to locate and send back to us when we thought there was no chance it would still be there. Thank you again to all the home owners that share their piece of heaven with us and our furry family member. Room 112 is one we can/will remember. Enjoyed our stay very much thank you. The condo was big and well stocked. One of the most thoughtful rentals we've stayed at. They thought of everything- from pool towels and coffee, to make-up removal wash clothes.Right on the ocean and the kids loved the pool! We had a wonderful time and would definitely recommend! First time in 112 - beautiful! We've been to Vacations by the Sea multiple times but this was our first time staying in 112. Absolutely fantastic view! Condo was well equipped with everything we needed for the weekend. We enjoyed the convenience of a first floor unit as did our 2 labs. We'd love to stay in this unit again! Will be looking to a return in the next few months! We so enjoyed our recent stay. Beautiful condo, unbelievable location and view! The ocean is out the front door; heaven on earth. Could not have been better. Will look for opportunity to come back! Had a great stay here on a stormy October weekend. Love the condo and the fact that the beach is so close. Stayed here for 3 days. It was a perfect place to relax and enjoy the beach and the ocean. The condo was quiet and peaceful. Even being in the complex the condo itself felt very private. what a great beach! My wife and I have stayed in various condo's through VBTS and have en joyed our stays every time. If your looking for some decompression time this is your spot. We had a wonderful weekend!! Celebrated my husband's birthday. The accommodations were fabulous. The view was incredible! We are our two dogs enjoyed the sunshine and beach. Thank you for the wonderful weekend! Thank you for celebrating your husbands special day with us! We're thrilled to hear you found the condo wonderful and we hope to see you again next year or sooner. We just love this complex, it never disappoints. This condo was clean, comfortable, and the views were terrific. Very easy, very nice condo. Quiet location. with the ocean right outside the door.we loved the experience of west port and look forward to another trip. We came to relax and that's exactly what we did! Town is close if we wanted to dine out and grocery store even closer if we wanted to eat in! A short drive south and there's Tokeland and Grayland as well. The beach here is the best! Close and clean! I loved that there were no vehicles allowed on this particular section of beach. Again, we absolutely loved it and will definitely return! Staff was very friendly and accommodating as well! Love love love Wesport and Vacations by the Sea! We had such an amazing time. As always everything was clean, convenient, and with personal touch. The beach was lovely and I always appreciate a place I can take my dogs! Highly recommend these condos and Vacations by the Sea. Our condo owners made this space absolutely beautiful and it felt just like home, but better! We had a wonderful Mothers Day weekend. The unit was well above our expectations - the location perfect the view awesome. We look forward to coming back next year. Great place for the family to take in the ocean experience. The place we stayed had incredible views. The condo was impeccably clean and comfy. The rental company was extremely friendly making this a memorable experience and one we hope to experience again! Thank you to all involved in making a great vacation! A couple minor maintenance issues- the kitchen sink faucet has a leak at the faucet nozzle, and the heat vent in the master bathroom needs to be re-secured so it doesn't rattle when the heater is on. Glad to hear you had a wonderful time and thanks for letting us know about the minor maintenance items, we'll take care of them right away! Hope to see you again soon. The ocean is at your feet! This condo was cute and comfy. We couldn't believe how close the ocean was! Lovely view of the water especially considering we were on the first floor. Pleased to be the Wakefield's guests for 2 nights & pay for a 3rd. Enjoyed the very comfortable 2br 2bth 1st fl pet friendly unit (wish ours could travel!) & the clubhouse amenities.